Some stocks don’t have much to brag about over the past couple of years and below we look at one of them! Mylan (MYL) has had a rough go of it the past two years as it lost nearly 50% of its value. During this decline could a pattern opportunity have formed. Possibly! 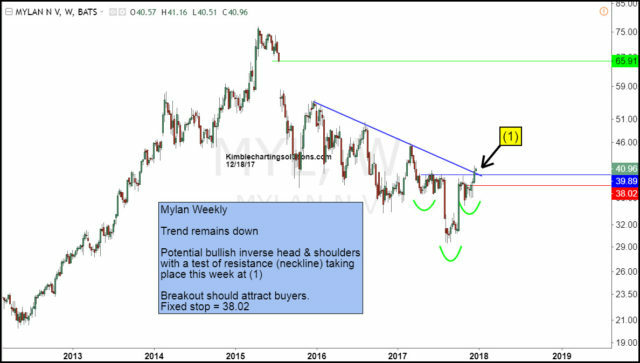 Over the past year, MYL could be forming a bullish inverse head & shoulders pattern with a test of the neckline and falling resistance taking place at (1). If a breakout takes place here, it could attract buyers to this hard-hit stock. Another thing that catches our attention is the large unfilled gap that took place back in 2015 at the $65 zone. 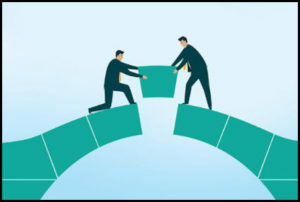 Often times “Gaps” end up getting filled. If this gap would get filled, MYL would make some nice gains from current levels. Full Disclosure- Members are long this stock with a tight stop.